Cube Dining Chair: It's comfort and sculptural design are perfect for many interiors and as always, the quality of manufacturing makes it an upholstered chair to live with for years and years. 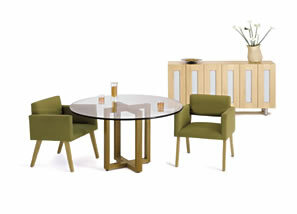 OS Dining Table: Simple and elegant design impeccably crafted in solid hardwood. 3/4" pencil-polished glass top. In House Credenza: These hand crafted cabinets are made to order at the In House Design Studio. Better workmanship cannot be found. The doors are solid hardwood (walnut, cherry, maple) and the inserts are sandblasted acrylic. Each double door opening comes with one glass shelf (more can be ordered). This heirloom piece is perfect for the dining room or living room. NEW! SHOP OUR ONLINE STORE!